Olentangy Liberty’s Lauren Spicer is defended by Pickerington Central’s Adrian Crockwell (35) during the first half of Saturday’s Division I district championship at Ohio Dominican University’s Alumni Hall. Olentangy Liberty girls basketball coach Sam Krafty called Pickerington Central “a college basketball team” after the Tigers’ 54-12 victory in a Division I district final Saturday afternoon at Ohio Dominican University’s Alumni Hall. So, the plan was simple. “We wanted to keep it close, put some pressure on them and make them crack a little,” Krafty said. The 23rd-seeded Patriots, who have upset higher seeds in each of their three tournament games this season, did that for the most part in the first half. They held the third-seeded and no. 1-ranked Tigers (24-2) to 16 points in the first half. But, Liberty couldn’t overcome Pickerington Central’s stout defense, which forced 14 turnovers in the first half and limited the Patriots to just two field goals en route to a 16-6 halftime edge. 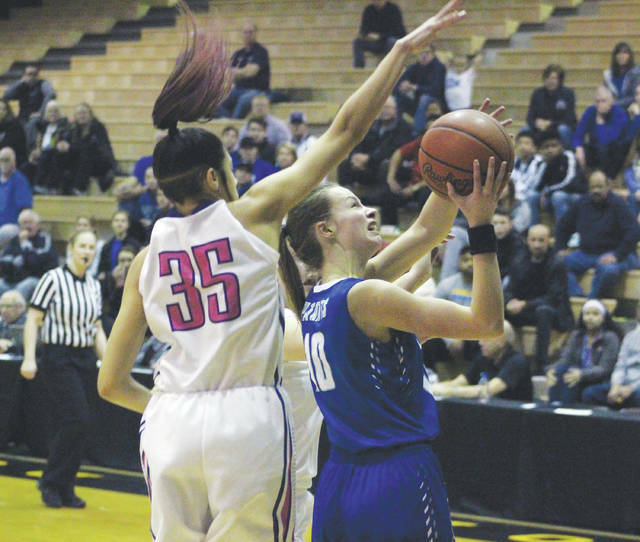 The Tigers kept Liberty from putting the ball in the hoop for 14:36, from a Kelly Levering basket late in the first quarter to an Emma Humenay three-pointers at the 4:00 mark of the third quarter. Pickerington Central used a 23-3 third quarter to break the game wide open. Neither team had a player finish in double figures. Kai Jones had nine points, Adrian Crockwell had eight and Maliya Perry added seven for the Tigers and Levering led the Patriots (14-12) with seven. Pickerington Central advances to the regional semifinal round and will face Gahanna Lincoln Tuesday night at 6:15 p.m. at Otterbein University’s Rike Center. As for Liberty – getting to this point in the tournament was a remarkable feat considering two of its top players (Teegan Pifher and Kennedy Kashmiry) were on the bench in heavy knee braces. Kashmiry was one of six seniors (Humenay, Lauren Spicer, Sydney Englehart, Jess Thomas and Mackenna Bay), who saw their roles increase after Pifher’s injury in the third game of the season. It was the second district title appearance for Liberty as a school – both in the last four years and both with Krafty as coach.